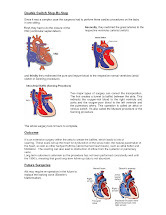 Congenitally corrected transposition of the great arteries is a complex, unusual abnormality in which the pumping chambers (ventricles) and attached valves (mitral and tricuspid valves) are switched. This condition exists at birth (congenital heart disease), but could remain unrecognized until adulthood. 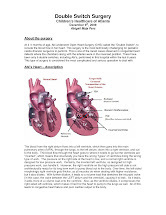 In congenitally corrected transposition of the great arteries, the aorta and pulmonary artery connect from the wrong lower heart chambers (ventricles), so the blood flows to the body from the wrong ventricles. The blood flows in the correct direction. Oxygen-poor blood from the body goes into the lungs to pick up oxygen and oxygen-rich blood from the lungs goes out to nourish the body. Data from the Baltimore-Washington Infant Study supported the fact that congenitally corrected transposition is a rare disorder. As many as 40 infants per 100,000 live births are affected by congenitally corrected transposition of the great vessels; this is fewer than 1% of all congenital heart defects. This disorder is reported in 0.5% of patients with congenital heart disease, and the literature reports fewer than 1000 cases. Most pediatric cardiologists have seen multiple cases of congenitally corrected transposition of the great vessels; however, the true prevalence of the malformation is not known. Children who have severe congenitally corrected transposition of the great arteries may need treatment within a week of birth. Adults who have a milder condition may live for years without symptoms. Symptoms usually reflect associated cardiac anomalies. The uncommon patient with isolated congenitally corrected transposition of the great vessels should be asymptomatic early in life. The diagnosis may be established via a chest radiograph or electrocardiogram performed for another reason; otherwise, this condition is usually diagnosed later in childhood or in early adult life when patients present with complete heart block or heart failure due to right ventricular decompensation or systemic tricuspid valve regurgitation. Observation and monitoring - If you aren't experiencing symptoms or heart rhythm disturbances, you should have regular observation and monitoring by an adult congenital cardiologist. A typical evaluation includes a thorough physical exam and tests. Medications - Your doctor may prescribe medications to improve your heart's ability to pump and reduce the effects of a leaky heart valve. Heart valve replacement. If your tricuspid valve allows blood to leak backward, your surgeon may replace the valve. Pacemaker implantation. Your doctor may implant a pacemaker to treat an abnormally slow heart rhythm (complete heart block). Ventricular septal defect repair. Your surgeon may close a hole in the wall between the two lower heart chambers (ventricular septal defect). Pulmonary valve surgery. Your surgeon may repair or replace the pulmonary valve or remove the blockage at or below the pulmonary valve (pulmonary stenosis). Double switch operation. In this procedure, your surgeon repairs a congenital heart defect, such as a ventricular septal defect, and reroutes the great arteries so the ventricles pump blood in the correct direction. Heart transplant. In people who have serious conditions, a heart transplant may be needed. If you have any congenital heart disease such as congenitally corrected transposition of the great arteries, you should discuss your plans for pregnancy with your doctor before becoming pregnant. Successful pregnancy is very possible.